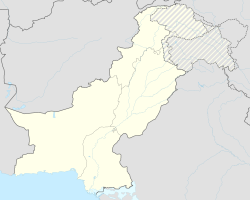 Abbottabad (Urdu, Hindko: ایبٹ آباد‬ Aibṭ ābād [ɛːbʈaːˈbaːd̪]) is a ceety locatit in the Hazara region o the Khyber Pakhtunkhwa province, in Pakistan. The ceety is situatit in the Orash Valley, 115 kilometres (71 mi) northeast o the caipital Islamabad an 150 kilometres (93 mi) east o Peshawar at an altitude o 1,260 metres (4,134 ft) an is the caipital o the Abbottabad Destrict. The ceety is well-kent throughoot Pakistan for its pleasant wather, heich-staundart educational institutions an military establishments. Abbottabad in a 1907 photograph. The toun o Abbottabad, unner the Breetish Raj, wis the heidquarters o the Hazara Destrict durin Breetish rule o Indie. It wis named efter Major James Abbott who foondit the toun an destrict in Januar 1853 efter the annexation o Punjab. He remained the first Deputy Commissioner o the Hazara destrict frae 1849 till Aprile 1853. Major Abbott is notit for haein written a poem titled "Abbottabad", afore he went back tae Breetain, in which he wrote o his fondness for the toun an his sadness at haein tae leave it. In the early 20t century, Abbottabad became an important military cantonment an sanatorium, servin as the heidquarters o a brigade in the Seicont Diveesion o the Northren Airmy Corps. The garrison consistit o fower battalions o native infantry (Gurkhas an Frontier Force) an fower native muntain batteries. In 1901, the population o the toun an cantonment wis 7,764 an the income averaged aroond Rs. 14,900. This increased tae Rs. 22,300 in 1903, chiefly derived frae octroi. Durin this time chief public institutions wur biggit such as the Albert Victor unaidit Anglo-Vernacular Heich Schuil, the Municipal Anglo-Vernacular Heich Schuil an the Govrenment dispensary. In 1911, the population haed risen tae 11,506 an the toun an aa contained fower battalions o Gurkhas. In Juin 1948, the British Red Cross opened a hospital in Abbottabad tae deal wi thoosans o patients who wur bein brought in frae the Kashmir fechtin auries. On October 8, 2005 Abbottabad wis devastatit bi the Kashmir earthquake. Awtho maist o Abbottabad survived, mony auld biggins wur destroyed or damaged. On 2 Mey 2011, Abbottabad gained warldwide attention when U.S. Preses Barack Obama annoonced that Osama bin Laden haed been killed in the ceety. The ceety is bundit at aw fower sides bi the Sarban hills, frae which residents an tourists can see breathtakin views o the region an ceety. The location o the ceety an the hills allous Abbottabad tae experience pleasant wather in the simmer an cauld winters. Neighbourin destricts are Mansehra tae the north, Muzaffarabad tae the east, Haripur tae the wast an Rawalpindi tae the sooth. Tarbela Dam is situatit wast o Abbottabad. Abbottabad is situatit in the Orash Valley lyin atween 34°09′N latitude an 73°13′E langitude at an altitude o 4,120 feet (1,260 m). Abbottabad haes a humid subtropical moderate climate, wi mild tae warm temperatures durin the ware an hairst months, humid temperatures durin Juin an Julie an cuil tae mild temperatures durin the winter. The temperature can rise as heich as 30 °C during the mid-simmer months an drop belaw 0 °C durin the winter months. Snawfaw can occur in Januar, tho it is sparse, while maist rainfaw occurs durin the monsoon saison stretchin frae Mey tae August an frequently causes floodin. Accordin tae the 1998 Census o the 881,000 who residit in the Abbottabad Destrict, Hindko wis spoken bi 94.26% o the population, follaed bi Potohari at 2.30%, Pashto at 2.22% an Urdu at 1.05%. Awtho the first leid o maist fowk in the destrict is Hindko, Urdu is unnerstuid an spoken fluently bi majority o the residents an commonly uised in mercats, offices an formal functions. Inglis is widely uised in business an eddication. The majority o the residents identify thairsels as either Abbasis, Karlals, Jadoons, Sayeds, Awans, Tanolis, Karlugh Turks, Sheikhs, Rajas, Qazis, Sadozai, Kashmiris, Mughals, Rajputs, Qureshis, Kakazais, Akazais, Utmanzais an Gujjars. Abbottabad is the heidquarters o Hazara Diveesion an Abbottabad Destrict. The Destrict Nazim, Commissioner, Inspector General an Forest Conservator aw reside in Abbottabad. The ceety is dividit intae localities, touns, colonies an neighbourhuids. 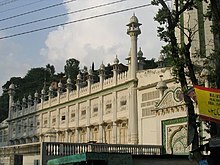 Ilyasi Mosque is an auld, ornate mosque locatit in Nawan Sheher o Abbottabad. The mosque is biggit on muntain spring. A view o Nathiagali, a tourist destination in the region. Abbottabad haes been attractin tourists tae the ceety syne the colonial era, as it is a major transit pynt tae aw major tourist regions o Pakistan such as Nathiagali an Naran. Accordin tae the Imperial Gazetteer o Indie, "the town is picturesquely situated at the southern corner o the Rash (Orash) plain, 4,120 feet (1,260 m) abuin the sea". Lik much o the mountainous Northern Areas, tourism is ane o the important soorces o income in Abbottabad. In the simmer when temperatures rise tae aroond 45 degrees Celsius in Punjab an NWFP, a lairge nummer o tourists traivel north tae Abbottabad. The Karakoram Heich-gate, which traces ane o the paths o the auncient Silk Road, stairts frae Hasan Abdal on the N5 an heids north passin throu the ceety eventually reachin Khunjerab Pass. The Karakorum Heichwey is a major attraction itsel for its views. The Karakoram, Himalayas an the Hindu Kush ranges can be approached frae Abbottabad an it continues tae be a transit ceety for tourists, servin as a base for visitin numerous nearbi places, such as Hunza, Gilgit, Skardu an Indus Kohistan, o the Karakoram Range. Abbottabad is kent for its heich staundart educational institutions an is commonly referred tae "The Ceety o Schuils". It hosts ane o the naition's youngest populations an haes attractit students frae athort the kintra. The ceety is an aa hame tae the Pakistan Military Academy, a fower-year coeducational federal service military academy that provides trainin tae the officers o Pakistan Airmy. The academy haes three trainin battalions, an 12 companies. Anither 2,000 guests each year, frae ower 34 kintras, receive some trainin at PMA. Abbottabad's main public transport consists o modifee'd pickup vans Suzukis, which can accommodate ony weys frae 1 tae 14 fowk at ane time. Taxis are an aa available as well as wagons which connect Abbottabad tae the surroondin ceeties an touns (ex. Nathiagali, Sherwan, Dhamtour, Haripur, Mansehra) in the region. Abbottabad is an aa served bi Daewoo Express an Niazi Express. Pakistan Railways daes no serve Abbottabad; housomeivver a PR Reservation Office is locatit in Fawara Chowk in the ceety centre. The nearest railwey station is locatit in Havelian, which is the last an maist northren station on the Pakistan Railway netwirk. The station is approximately thirty minutes drive sooth frae Abbottabad ceety centre. Wikimedia Commons haes media relatit tae Abbottabad. ↑ 2.0 2.1 "Pakistan Military Academy - Cadets Training". Pakistanarmy.gov.pk. 1948-01-25. Retrieved 2011-05-03. ↑ 4.0 4.1 4.2 "Abbottabad Town – Imperial Gazetteer of India, v. 5, p. 1". Dsal.uchicago.edu. Retrieved May 2, 2011. ↑ "The Project Gutenberg eBook, The Panjab, North-West Frontier Province, and Kashmir, by Sir James McCrone Douie". Gutenberg.org. Retrieved May 2, 2011. ↑ "Partition of India and Pakistan 1947 – British Red Cross". Redcross.org.uk. Retrieved May 2, 2011. ↑ "Doctor's diary". BBC News. October 14, 2005. Retrieved May 2, 2011. ↑ L. Meckler, A. Entous and Z. Hussain (May 1, 2011). "U.S. Forces Kill Osama bin Laden Obama Says Sept. 11 Attacks Avenged in Commando Assault on Pakistani Compound; Body of Terror Mastermind Captured". The Wall Street Journal. ↑ "Osama bin Laden is dead, Obama announces". The Guardian. May 2, 2011. Retrieved May 2, 2011. ↑ "Weatherbase: Historical Weather for Abbottabad, Pakistan". Weatherbase. 2009. Wikisource haes the text o the 1911 Encyclopædia Britannica airticle Abbottabad. This page wis last eeditit on 11 Mey 2018, at 17:11.